Similar to Aljovin's list for Carcassonne; I am creating one about Alhambra. i have just recently acquired this game after reading many good things here on BGG. I have also gotten the first expansion, but I thought others could contribute about the other expansions and any off-shoot games (if there are any). here is the base game - I really like the simple choices, but yet the differences in currency and scoring concept make it a game of enough meat to keep you satisfied. And here is the first expansion: haven't played it yet, but I like that the various options (and you don't have ot use them all) really do nothing to change the basic rules at all. 6 wooden gate pieces, 1 per player, and 6 gate cards that are added to the currency deck. 8 tiles, which are mixed in with the other buildings. A bag of 24 coins (6 in each currency), that players can pick at random for every 2 they overpay by. 12 thief cards, 3 of each currency, that are dealt out to the players at the start of the game. A thief can be discarded to draw an additional money card of the same colour as the thief. 8 wall cards and 12 wall segments. The cards are added to the currency deck, and when one or more come out, players may take a new action of taking the wall card to build additonal walls. 6 merchant tiles and 42 residents, 7 in each of the 6 building colours. Points are scored each scoring round for residents in buildings. Re-branded with the Alhambra name attached, it appears that this was originally released in 1993 as 'Carat'. A more abstract tile-laying game, it lacks the currency/payment mechanic of Alhambra. 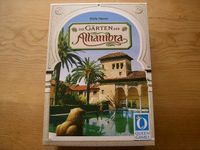 For completeness, we should also add the limited edition version of the Alhambra base game produced in 2005 in conjunction with the business community of Queen Games' home town of Troisdorf. -Die macht des Sultans (the power of the sutan). Cards and a dice. You can buy the card for 7 of the indicated color. Then you role the dice and mark the building on the card. When a new building of that color is added to the building site, you can take it, even if it is not your turn. -Die neuen Wärtungskärtchen (the new valuecards). Tiles. 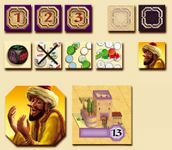 At the beginning of the game you draw 3 tiles which show different rankingorders for the buildings for the three valuations.